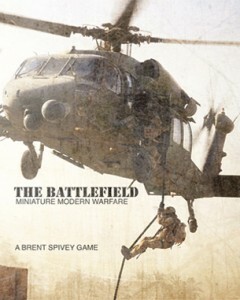 Bombshell Games is proud to be launching the print edition of Battlefield. So happy, in fact, that they're having a sale. The print edition of The Battlefield has launched today taking the tactical first and third person modern combat shooter experience worldwide. The full color book is available on Amazon.com, Amazon.co.uk, Amazon.de, Amazon.es, Amazon.fr, Amazon.it, and here in the the site's Shop. Not only that, but as a small thank you to everyone for supporting and purchasing the electronic edition, I'm offering a special 25% discount on the book for a limited time. Just use this link and enter the code GAA3MVCU when you checkout. Note! This discount code for the print edition can only be redeemed on www.bomshell-games.com and not on Amazon. And yes... this discount means the combined price of both the PDF and the print edition is less that many other rule sets! If you plan on using the discount and are ordering from outside the United States, then make sure to compare the shipping rates and prices to ensure that you are using the method that will get you the best deal.